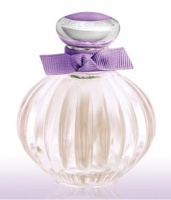 An exuberant bouquet of lilac, jasmine and fresh mimosa blossom. Feel the magic of beautiful flowers. Additional notes include grapefruit, green pear, gardenia, honeysuckle, peony, orris and sandalwood. Why is purple so appealing to me lately? and Lilacs….I love lilacs…unfortunately that seems to be such a difficult note for perfumers to express in a perfume without it going to plastic or airfreshener. Why do I think it’s going to end up being floral, tuberose mess? Guess I’ll have to go try it. And—love the bottle! Looks suspiciously (read: exactly) like a Tocca bottle. I wasn’t paying much attention at first glance when I loaded the page I thought it -was- a Tocca bottle since they recently released Bianca. Ditto on the Tocca bottle. This has come up before, and it was established then that Tocca was not the first to use this bottle. But of course now I can’t remember who was. Oddly, Avon also had a similar bottle, way back when. I had my first perfume (well, “perfume”) in a similar bottle, which was Avon Honeysuckle. I just realized that’s why I find the Tocca bottles strangely comforting to look at. There’s only so many shapes in the world and no one has a patent on “round” and “fluted” –it’s just the first thing I thought when I saw the picture. I love the Tocca bottles, therefore : I love this bottle….won’t influence a purchase though. Has anyone tried the American Beauty / Flirt! scents? I’m intrigued but there are no Kohl’s near me. A friend gave me a Flirt! scent, and I’ve spent time at Kohl’s sniffing around. I have to say that while they are tolerable they definitely smell like lower-end fragrances: Very synthetic, and pretty flat. Thanks Minnie. I like a lot of the Estee Lauder fragrances, and was hoping these would be similarly complex. Yeah, I think there is definitely more complexity and subtlety to The Estee Lauder fragrances. They’re ok for the price. None of them has wowed me otherwise. I can’t even bring myself to read the description, I can’t get past the name. American Beauty Beloved Purple Blossom? Sounds like a My Little Pony name. Gag. I think I’d be more inclined to buy it is if *was* a My Little Pony. Looks like a cross between a Cloe bottle and a Tocca bottle. I really like the sound of the notes, if it has some luminosity to it, it might be a fun girly scent to wear (for me). If the ingredients are cheap though, it may make me sneeze and feel nauseous. Avon scent don’t, are the American Beauty scents better than Avon? Hard to say, I try almost nothing from Avon & have tried these only very briefly. @alotofscents: this is exactly my perception from the original Beloved. It seemed light, luminous, fun and girlie at first, but made me feel nauseous quickly. So I’m not even leaning towards trying this one. On a separate note, the picture in the ad is perfect! Is it just me or is “Feel the magic of beautiful flowers” the lamest perfume description ever? I mean I’ve read alot of silly ones nonsensical descriptions, but that’s just dumb. I guess Estee Lauder saves all their good product descriptions for their department store brands. It’s pretty lame, but no, not at all the lamest! But you’re right: they really put remarkably little effort into the online marketing of the American Beauty scents. This is an awesome scent. Reminds me of Laura Ashley No 1 which is super expensive if you can find a bottle of it that someone wants to sell.